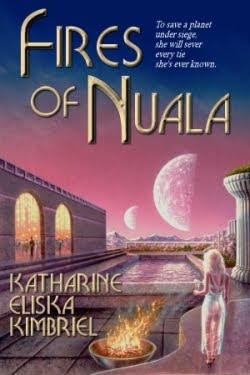 I want to share with you that Katherine Eliska Kimbrel’s backlist science fiction romance FIRES OF NUALA is officially re-released in eBook. Book View Café is offering it in PDF, EPUB, MOBI and PRC formats. Not only that, but Book View Café is serializing it Thursdays, beginning with Chapter One here. Kindle owners can purchase FIRES OF NUALA as well. Click here for more information. HIDDEN FIRES, another book in the series, has an all-new cover (scroll down) and is scheduled for a December 1, 2010 release at Book View Café. Look for the Kindle version of HIDDEN FIRES in 2011. You can also follow news of the author’s books on her blog. And remember: Any day is a good day for reading science fiction romance!